Every Christian—even a few agnostics I know—understand the real meaning of Christmas. It’s written in John 3:16. For God so loved the world, that he gave his only begotten Son, that whosoever believeth in him should not perish, but have everlasting life. 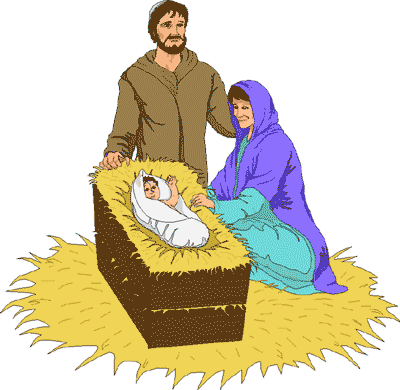 But according to most biblical scholars, Christ wasn’t born in December. He was most likely born in September, about six months after Passover. But early Christians wanted to convert the Pagans and they were already celebrating in December. The ancient Babylonians were partying it up in celebration of the feast of the Son of Isis. And way back in 46 BC, Julius Caesar marked his Julian calendar on December 25 as the date of the winter solstice. On that day, Romans celebrated rebirth, gathering and feasting in celebration of the shortest day of the year. In other parts of Europe, the pagans celebrated the birth of the Sun God, Mithras on the shortest day of the year and called it Yule. They’d toss a (Yule) log onto the fire and bring live evergreens into the house, decorating them as a reminder of the coming spring. The Druids also used evergreens as a religious symbol. They gathered around ceremonial trees and celebrated. There might even have been a sacrifice or two. But after Christ was born, the pagans didn’t want to give up their parties. So, Christmas became an annual celebration on December 25th with trees and Yule logs and that jolly fellow known as Santa Claus. 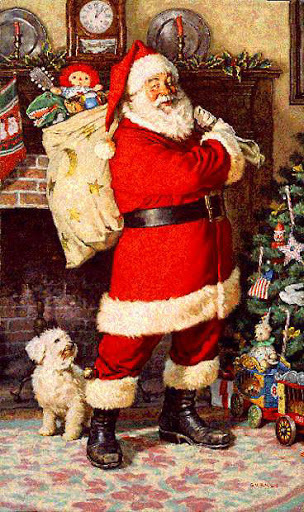 Santa, also known as Saint Nicholas, Father Christmas, and Kris Kringle originated in Holland. He’s a mythical character who delivers gifts to good children on December 24 or on his Feast Day, also known as Saint Nicholas Day on December 6. Santa’s original wardrobe was a bishop’s robes, but he somehow morphed into a jolly fat man wearing a red suite. In America, Santa Claus lives in the North Pole, has eight tiny reindeer who can fly and a shiny nosed leader of the pack known as Rudolf. He also has a crew of elves making toys and spying on children to make sure they make his “good” list. But what happens to the children who wind up on the Naughty list? In Austria and Bavaria, Santa has a helper, an evil counterpart who switches naughty children. Krampus is also a prominent Christmas figure in Croatia, Slovakia, Slovenia and northern Italy. Good little children get presents from Santa. Naughty children get a switching from his demon-like helper, Krampus. The American tradition of leaving naughty children switches and ashes comes from Krampus. But in America, no demon like figure follows Santa Claus around to dole out the punishment. Krampus festivals are traditionally held during the first two weeks of December. Young men dress up in goat furs, horns and masks and roam the streets frightening children and women with rusty chains and bells. They also use a birch branch to switch young girls. Krampus sometimes carries a basket on his back to carry away bad children. Quite the contrast to Santa and his sack of toys! 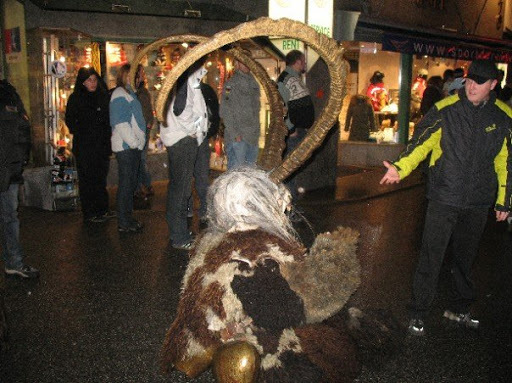 In Austria, there’s a Krampus festival and it usually starts with a parade. 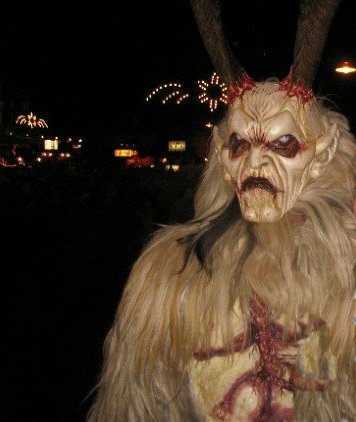 Young men dress up as Krampus and race through town waving torches, rattling chains, ringing cow bells, and swatting young women and children with birch branches. 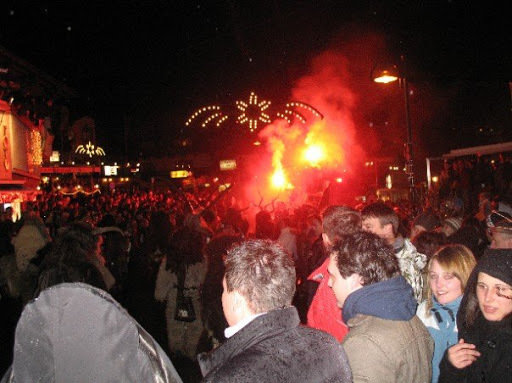 The Krampuses arrive in the center of town—usually pretty intoxicated—and gather around a roaring bonfire. Afterward, there’s more drinking and plenty of revelry. I’ve never witnessed one of these festivals myself, but my daughter has and it was definitely an experience she’ll never forget. 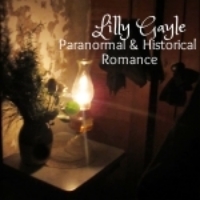 So, this year when you’re celebrating Christmas with something more traditional like attending Church or Mass or awaiting Santa’s arrival, remember that even holidays have a paranormal side.